We must have the truthful weight of each rider; if you are in doubt, please err on the side of overestimation. If the riders are of questionable weight, we have a scale on-site. If a rider is too large for the horse reserved, they may not be able to ride since there may be no large substitutes available. Larger riders must ride the larger and taller horses. Therefore, they must be in good athletic shape in order to mount. We do not recommend horse riding for overweight persons or the elderly or those with arthritis especially if in the hips. Ages 7 and up are usually competent enough to follow directions and strong enough to pull up on the reins if their mount stops to snack. We prefer to book timid riders to go along with slower "kid rides," so please mention if you wish a slower or faster ride, and we will try to book you on a compatible ride. We have riding helmets available; they are mandatory for kids under 12 yrs. of age and are highly recommended for riders with short legs. Cruise Ship Passengers: The MORNING ride is a good match. If the morning ride becomes fully booked, we may open a mid-day ride but only if there is sufficient demand. The afternoon rides are usually not practicable for cruise ship passengers, since most cruise ships require you to re-board the ship by 5 PM. Regular Customers: Depending on the season and the demand, there may be an AFTERNOON ride, a MORNING ride, or both. Specific check-in times are given when you make your reservation, but the morning ride is late morning and the afternoon ride is usually always after 3PM. 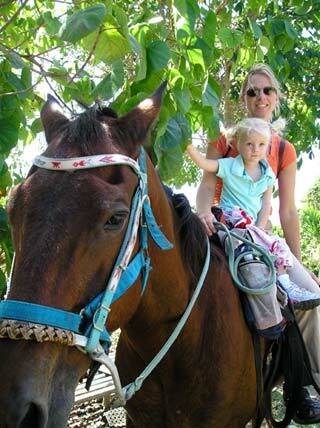 For families with small kids though, we usually recommend the MORNING ride.